Abuja: A pro-Biafra leader whose arrest sparked a wave of protests across Nigeria’s southeast has told AFP from jail he is a “prisoner of conscience” and vowed to realise his dream of an independent state. The head of the Indigenous People of Biafra (IPOB) group, Nnamdi Kanu, is accused by the state of “propagating a secessionist agenda” with the intention to “levy war against Nigeria”. 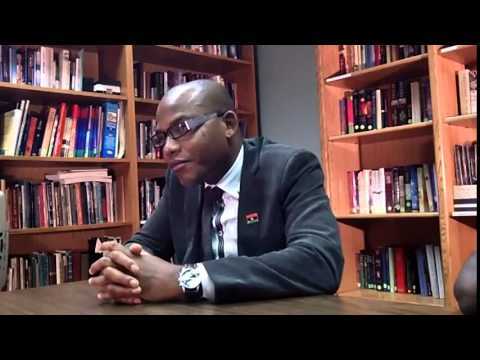 Kanu, who also runs the London-based Radio Biafra, is facing charges of treasonable felony, managing an unlawful society and illegally shipping radio equipment into the country. He has been in custody since his arrest in October, despite being granted bail, and denied all charges. His arrest and continued detention has made him a figurehead for his supporters, whose repeated marches in the southeast have increasingly led to clashes with the police. “Biafra has come to stay,” Kanu told AFP in a text message via his brother, Prince Emmanuel Kanu, who met him on Thursday in Kuje prison on the outskirts of Nigeria’s capital Abuja. A previous unilateral declaration of an independent Republic of Biafra in 1967 led to a brutal civil war that left more than one million dead in nearly three years of fighting. Forced to surrender and chastened by war, dreams of a separate state for the ethnic Igbo group—the third largest in the country—waned. But Kanu’s arrest and detention has galvanised support for the Biafra movement among young people who never knew the horrors of war and have little to lose in fighting for a better life. Today the former regional power is impoverished, with dilapidated infrastructure and high unemployment fuelling resentment against the federal government. “We have been failed in so many ways,” Kanu said, describing Igbos as “third class citizens”, echoing many in the region who say they are still being punished for the civil war. Kanu, who has described Nigeria as a “zoo” which “has to come to an end”, was a relative unknown before his arrest. But President Muhammadu Buhari, facing security threats from Boko Haram in the northeast and an uneasy peace in the oil-producing south, has said Kanu poses a threat to Nigeria’s fragile unity. In December, a finger-wagging Buhari said Kanu committed “atrocities” against Nigeria, adding “there’s a treasonable felony against him and I hope the court will listen to the case”. Dressed in an outfit of pristine white and sporting a neat salt-and-pepper beard, Kanu last appeared in public at an Abuja court Tuesday, arriving in handcuffs and flanked by prison officers. His lawyer spent the bulk of the afternoon fighting a state application to have some proceedings held behind closed doors. The prosecution alleges Kanu was running an armed group with ritual baptisms and young men conscripted as “Biafran soldiers”. Kanu’s half-sister, Tonia Kanu, said the current response to the protests was only worsening the situation. After the judge adjourned Kanu’s case until February 19, Tonia received reports that police had shot dead protesters in the southeast city of Aba. A day later, police confirmed two protesters were killed, with 21 IPOB members arrested. “People are being killed every day just because of peaceful protest. It’s too bad,” Tonia told AFP. She flicked through her Facebook feed on her smart phone to show gory photos of dead protesters and a coffin covered with the Biafran flag—red, black and green with a yellow rising sun.